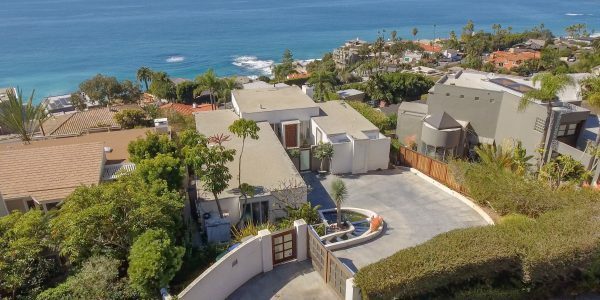 This contemporary-styled, 2,880-square-foot home in the Coast Royal neighborhood offers whitewater, ocean and Catalina views. The house is located behind a private gated driveway that offers seclusion. A koi pond and fountain along the 100-foot driveway leads to a gated courtyard. With three bedrooms, two bathrooms and an office, the home features an open concept layout. 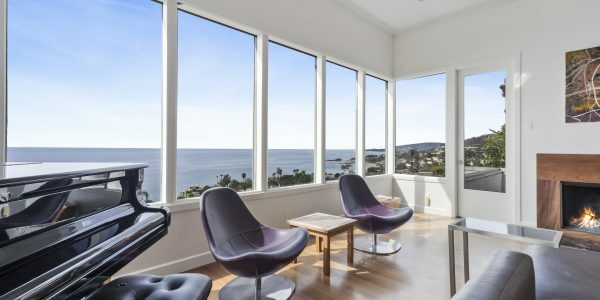 Panoramic ocean views can be enjoyed from the living and dining rooms, which feature high ceilings and wood floors. The main floor master suite also offers plenty of views and a deck. The home also includes a media/family room with sound system, multiple view decks and walls of glass, and two spacious secondary bedrooms near the office with a separate entrance. The seller has expired DRB approved plans by architect Horst Noppenberger to add additional square footage, pool and decks. The undergrounding of the utilities has recently been completed.